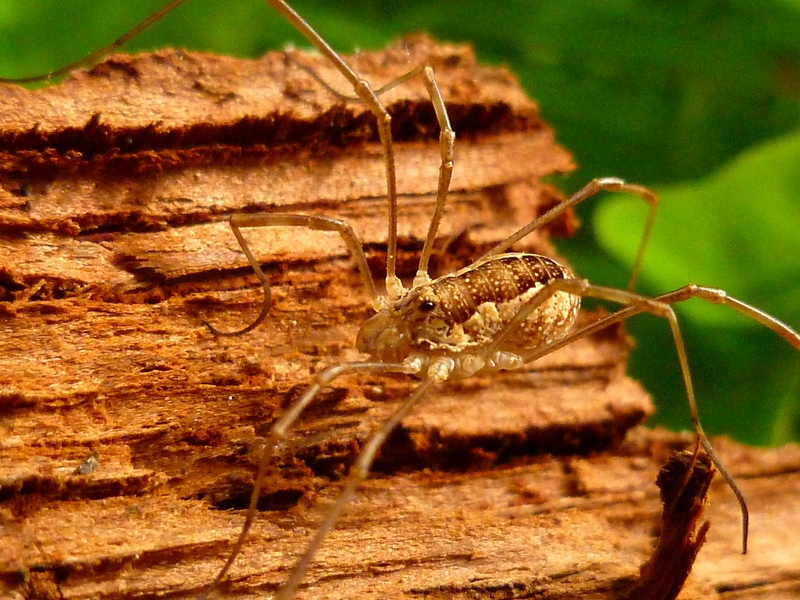 Rilaena triangularis is a harvestman with a life cycle that is different from most other harvestmen in temperate regions. While most species pass the winter either as egg (mostly long-legged species) or as adult (mostly short-legged species that live close to the soil), Rilaena triangularis does this being a juvenile. This means that it can be found as a (sub)adult very early in the year: from late March onwards, when most other species are in the juvenile stage. 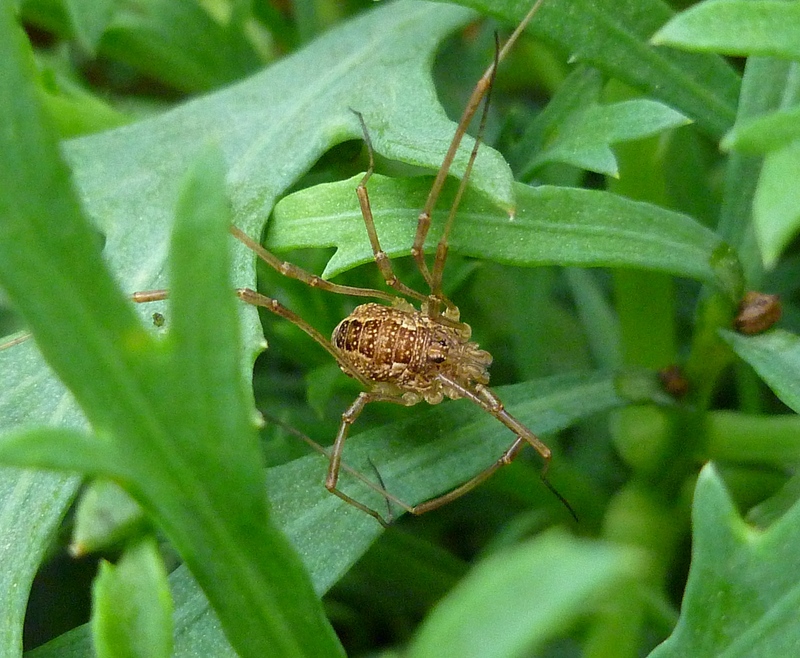 This characteristic of R. triangularis has given it the common name of spring harvestman. 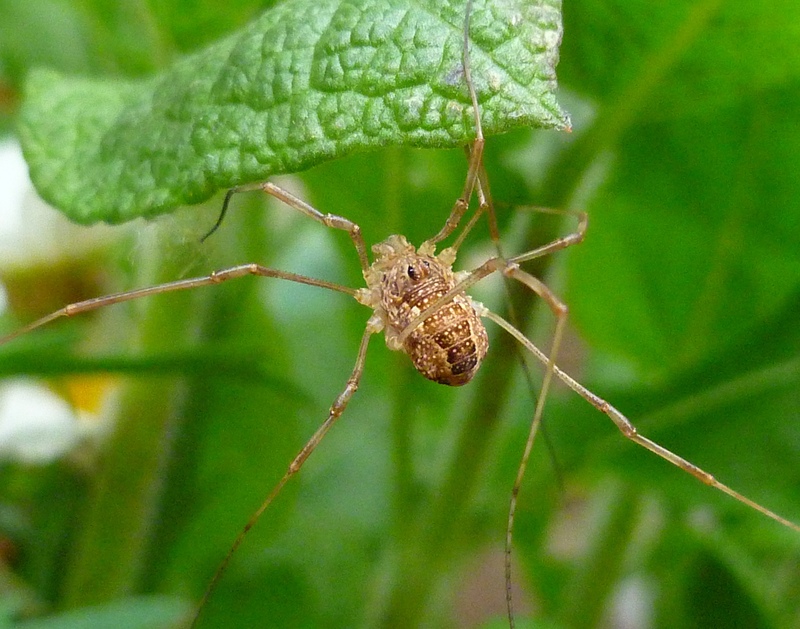 So, have a look in your garden today, and if you see a fully grown harvestman you know who it is! The juveniles survive autumn and winter living in the upper soil layer, in leaf litter or under pieces of dead wood. Adults can be found higher up, on trees or walls, in bushes, or on grasses and herbs, and die already around the end of july. R. triangularis shares this biology with a few other species that are closely related within the genera of Platybunus and Megabunus. But these species look different and are less widespread. The spring harvestman is best recognized by its unusually large ocularium (eye hill) with large black eyes and two rows of blunt spikes running on top. Males and female are both light to medium dark brown and often have a darker saddle with a pale outline. It is usually the females who have the most pronounced saddle, and they are a bit larger too (5-7 mm, males being around 3-5 mm). The places where the legs are attached to the body have a light greyish or beige colour. The spring harvestman is very widespread not only in Europe – with the exception of northern Scandinavia, the high Alps and the Mediterranean – but also in other parts of the world, including the USA.